Kai is a nigh-indestructible zombie super-assassin, of course. Other Aliases: The Last of the Brunnen-G, The Dead Man in Black, The Law. Height: 5’7” Weight: 355 lbs. Kai is, in principle, a robust, but nimble zombie. His body is tough enough to endure most biological, energy and melee weapons. If damaged he regenerates at a fantastic rate, even injuries such as a chopped off head. Stopping him is near impossible by conventional means. Having worked as his Divine Shadow’s elite assassin for over two millennia, Kai is a skilled killer (in DC Heroes terms, he often does Critical Blows). His weapon of choice is his hand weapon, although he will, on occasion use his hands, feet or other ranged weapons. Very often, he kills several opponents in a very short time span, taking everyone by surprise (and probably spends Hero Points doing so). Naturally, he is extremely silent and can even mimic others voices with superhuman accuracy. Kai’s greatest asset is perhaps not his physical might, but rather his cold intellect. In fact, he retains the memories of everyone he has killed as his Divine Shadow’s assassin, making him into a powerful source of information and wisdom. Therefore, his deductive and analytical abilities are top-notch and he is often the only one to see a flaw, a mistake being done or sneaking characters. Therefore, he often saves the day after having formulated a plan of action. Kai has been dead for the last 2,008 years. It seems to be impossible to put him to permanent rest, although vaporizing his molecular structure would do the trick. Scientists noted that placing him in the plasma exhaust of a powerful rocket would vaporize him, and yet he later survived being in the vicinity of a nuclear detonation. Normal weapons will not affect him at all, with one exception; it seems to be relatively easy to decapitate him (in DC Heroes terms, any such aimed attack are done with -2 CS to his RV). When decapitated his head still functions, while his body lies still, until the head is reattached again. He needs no nutrition or air, but requires “protoblood” to keeps his vital organs animated and stops him from decomposing. The origin of animation is based on cyborg technology, and he therefore weighs a lot; he does not float on water. He has enough “protoblood” in storage to keep him active for months, although finding a new source would be extremely difficult. In DC Heroes terms, he can temporarily run out of “protoblood”, and thus fall down dead, if he fails a reliability roll of R#2 on any physical action. He will then immediately spring back to life and action when his blood has been replaced with new material from the LEXX. Being dead, Kai has very little motivation to do anything. He is motivated when charged with the task of protecting the crew, an assassination mission, or when he requires “protoblood”. When his services are not required he is kept in cryo-freeze to maximize his duration. He has to be reawakened manually or by the LEXX, he cannot wake up by his own free will. Many of those he meets in the light universe recognize him as either a hero of the old tales. They see him either the last of the Brunnen-G, who led the battle of humans against the insectoid race, or as a notorious and legendary assassin of his Divine Order. An intro sequence to the LEXX show, showing many of the characters who have a writeups.org entry plus the ship. Kai is the last of a race of romantic dreamers and warriors. His species, the Brunnen-G, long ago defeated the insects in the bloody war that raged between the bugs and the humans. During his life he was a leader and a philosopher. Then, 2000 years ago, came the war with His Divine Shadow, and it was foretold that Kai would be the one to ultimately end the reign of the Divine Order. In the final battle between the Brunnen-G and the Divine Order, the civilization of the Brunnen-G, and its homeworld Brunnus II, were completely destroyed by the Foreshadow, a planet-killer battleship. Kai was personally killed by His Shadow who, in a fit of arrogance, decrees that Kai, as the last member of that race, would be resurrected and used to serve His Shadow’s own evil plans. Kai received “protoblood” and was turned into an undead assassin without memory or personality, working for the Divine Order. He was under the control of His Shadow for 2008 years, killing thousands of people. 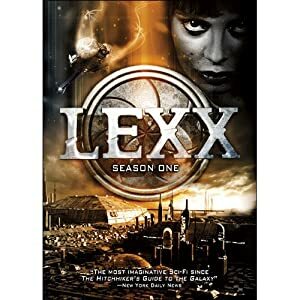 At that point of time, heretics took control over the LEXX, the most powerful weapon of destruction in the 2 universes, and Kai was chosen to hunt them down. Unfortunately for His Shadow, Kai regained the memory of his former life by accident during this mission and thus broke the Divine Shadow’s control over him. He also gained the memories of all those he had killed over the years, becoming a powerful source of information and wisdom. The Time Prophet had foretold that the Last of the Brunnen-G would destroy His Divine Shadow and end the Divine Order of the League of 20,000 planets. Kai obliged, first by killing the body of His Shadow, then by squashing part of his brain and still later by letting loose his pet Cluster Lizard, Squish to eat the other part of his brain (His Shadow is a hard bloke to kill). The prophesy was thus realised. Kai joined the crew of the LEXX by default really, having nothing better to do at the time. He currently serves as an de facto bodyguard to the rest of the crew since it is the right thing to do, despite not having any personal ambitions at all. Kai is always clad in a full body suit of black and dark purple cotton, which is, in fact, the suit of an assassin of the Divine Order. He has strange, voluminous black hair and a strand of long hair falling down on the left side of his face. He also has a peculiar line-formed birthmark on his left cheek. For being a corpse, he appears surprisingly attractive. Beneath his clothing he wears some cyborg parts, which are part of the technology that keeps him going. While still alive he used to wear very colorful clothing. When not killing anyone, Kai moves in a very relaxed, rigid fashion, but explodes into lightning action when needed. He walks with an unusual style, a mixture between John Wayne and a wobble. He appears to give an impression of being analytical, cool and even philosophical. Kai has very little personality left, and no sense of humor. Kai has completely come to terms with the fact that he’s dead, and therefore has no personal agenda. He sees to it that the crew come to no harm, and has a very well developed sense of duty and justice. Of course this doesn’t always work to the crew’s advantage, especially if they’re trying to get away with something that Kai doesn’t think they should be allowed to get away with. Being dead, his body is in constant danger of degenerating. To prevent this he sleeps in a cryopod when not needed, to preserve his supply of “Protoblood”. This is the substance that keeps him “alive”, or rather animated. At first upon reclaiming his freedom, Kai didn’t personally give a damn about being alive. If it wasn’t for Zev insisting, he’d quite happily have just wasted away. There is, however, some indication that the feels some remorse for his reanimated existence of death and destruction and possibly wants to make amends now. Now he usually springs into action when the LEXX crew has problems. Other than that, Kai has no motivation, no real emotions, and can be frustratingly obtuse sometimes, all of which conspire against Xev when she’s trying to get him into bed. He does however have an endearing habit of going completely mad at the most inopportune moments. He is thus usually the one to detect when something is wrong. He therefore saves the crew of the LEXX on regular basis since it is the right thing to do. When reacting to outside events his jaw sometimes quivers. All of this sums up to the point that Kai used to be a great hero before his death, and that the same principles of heroism still apply to him in certain matters. It can also be assumed that Kai still has retained some of his imaginative and creative talents after his death, as seen in a couple of episodes, although that he prefers not to use those abilities in his normal, dead self. Also, given the high technology level, the LEXX with crew fits well in the Legion of Super-Heroes era. They’d fit even better directly after one the major world wars to have preceded that era had ended. An era that was until then ruled by the tyrannic Shadow, ruling many of the planets to later form the United Planets network. SL: Animate Dead is Always On, making him into a walking, dead man (-1). Recall only works to recall information possessed by one of the thousands of victims he killed as his Divine Shadow’s assassin (-2). Attractive, Highly Advanced, Iron Nerves, Lightning Reflexes, Omni-Scholar, Stability. Stanley H Tweedle (High), Zev/Xev Bellringer (High), 790 (Low; High during Season 3). Partial Attack Vulnerability (Decapitating attacks – 2CS RV), CPR (Kai is dead (see below) and has a R# of 2), Forced Exile (Dark Universe, after the 2nd season only). 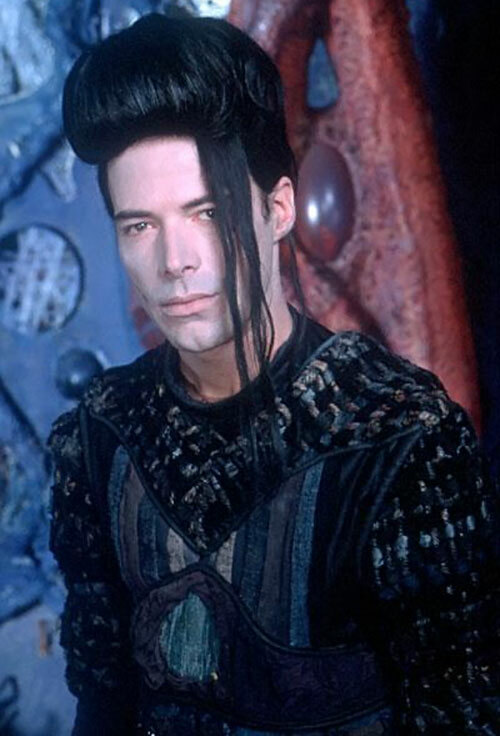 Source of Character: Lexx TV-series, Character played by Michael McManus. Helper(s): Scifi, the LEXX fan club, Sad Geezer , the IMDB, Eric Langendorff.